Raising a good man is one of the most important jobs in the world, and mamas, I know you take it seriously. I take it pretty seriously too. With 11 and 6-year-old sons I think a lot about the young men my boys are poised to become. Will they be good men? How will they one day serve humanity? Will they call me every Sunday? Will they dread those calls? I don’t have the answers to these questions, but I do have a game plan. You see, as any Listy McListerson person does, I developed a wish list of character traits I hoped to instill in my sons and worked backwards to create a list of 25 rules for myself as a mother inspired by Diapers & Daisies 28 Rules for Fathers of Sons. 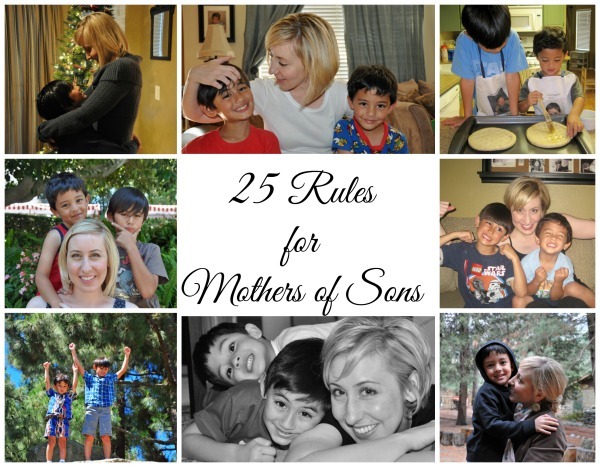 Today I share this list of 25 rules for mothers of sons composed with an open heart, because gentle reminders of where we’re headed and why just feel good.